New Works for Recorder and Piano. 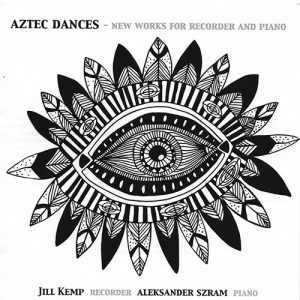 Although written originally for recorder and piano, Edward Gregson’s Aztec Dances (2010) may be more familiar in its alternate guises for flute and piano—premiered by William Boustany with Aleksander Szram in 2011—or as a chamber flute concerto, recorded by Chandos on a highly recommendable all-Gregson CD (CHAN 10822, with Boustany again as soloist). The music fits the flute like a glove but, as Jill Kemp’s lively rendition proves, so does it the recorder. The inspiration came from the British Museum’s marvellous 2009 exhibition, ‘Moctezuma—Aztec Ruler’, especially the role music played in Aztec life and ritual. The opening ‘Ritual/Pastorale’ is static and solemn, succeeded by an invigorating ‘Fertility Dance’. The heart of the work, however, is the extraordinary ‘Ghost Song’, a disturbingly atmospheric invocation, running for almost half the length of the concerto, to the Creator god Tezcatlipoca, whose name is uttered twice. Tezcatlipoca was honoured by human sacrifices, and a barbaric ‘Sacrificial Dance’, with a nod to Stravinsky’s Rite, concludes the whole.